We haven’t heard much from Silicon Valley based Ingenio lately. In 2006 the company launched Ether, a service that allows people to charge people for calls. Since then, nada. But today AT&T is announcing that they’ve acquired the company and plan to integrate it into its directory service and local search advertising portfolio (yellowpages.com, etc.). The Pay Per Call service will allow advertisers to reach potential leads. Ingenio was founded in 1999. Terms are not being disclosed, although AT&T is saying it expects the deal to close in January 2008. Looking for a link to the press release. A draft is below. SAN ANTONIO, Nov. 19 — AT&T Inc. announced today that an AT&T subsidiary has agreed to acquire privately held Ingenio, a leading provider of Pay Per Call(R) technology. The transaction is expected to close in early January 2008. AT&T plans to integrate Ingenio’s Pay Per Call solutions into its directory service and local search advertising portfolio, including the YELLOWPAGES.COM Network, AT&T Real Yellow Pages and 1-800-Yellow Pages. Ingenio’s Pay Per Call service is an advertising platform that allows businesses to manage their ad programs and generate valuable phone leads. The platform uses proprietary technology to provision unique published phone numbers to track calls to businesses generated by those ads, and advertisers’ fees are based on the volume of these leads. Pay Per Call technology will provide another lead generation tool for advertisers to reach customers. Integrating Ingenio’s Pay Per Call technology will enable AT&T to take advantage of a growing trend toward performance-based advertising. The move also demonstrates AT&T’s commitment to providing advertisers with comprehensive solutions – the addition of Ingenio’s Pay Per Call technology will give advertisers the flexibility to purchase leads in a consistent manner across online, mobile or print media whether or not they have a Web site. Following the closing of the acquisition, Ingenio will be integrated within AT&T’s YELLOWPAGES.COM and will be overseen by Charles Stubbs, president and CEO of YELLOWPAGES.COM. AT&T expects to retain Ingenio’s management team. The transaction is expected to have minimal impact on AT&T’s results, including earnings per share. 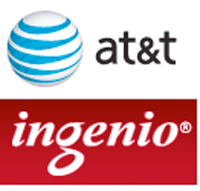 The addition of Ingenio further enhances AT&T’s portfolio of directory offerings. YELLOWPAGES.COM and AT&T Real Yellow Pages deliver unsurpassed visibility and value to advertisers. AT&T delivers print directories to more than 83 million residences and businesses in 22 states and has a premier online presence nationwide with the YELLOWPAGES.COM Network. Together, these products receive more than 5 billion consumer searches a year for local business information and provide more than 1 million advertisers with valuable sales leads to help their businesses grow. AT&T’s YELLOWPAGES.COM also recently expanded its mobile search products with a new Web application for iPhone users, as well as a downloadable local search application that is currently available on 20 popular AT&T handset models. These applications make it easy for consumers to find what they need, when they need it and extend YELLOWPAGES.COM advertisers’ presence to on-the- go consumers. AT&T Inc. is a premier communications holding company. Its subsidiaries and affiliates, AT&T operating companies, are the providers of AT&T services in the United States and around the world. Among their offerings are the world’s most advanced IP-based business communications services and the nation’s leading wireless, high speed Internet access and voice services. In domestic markets, AT&T is known for the directory publishing and advertising sales leadership of its Yellow Pages and YELLOWPAGES.COM organizations, and the AT&T brand is licensed to innovators in such fields as communications equipment. As part of its three-screen integration strategy, AT&T is expanding its TV entertainment offerings. Additional information about AT&T Inc. and the products and services provided by AT&T subsidiaries and affiliates is available at http://www.att.com/. (C) 2007 AT&T Intellectual Property. All rights reserved. AT&T, the AT&T logo and all other marks contained herein are trademarks of AT&T Intellectual Property and/or AT&T affiliated companies. For more information, please review this announcement in the AT&T newsroom at http://www.att.com/newsroom. YELLOWPAGES.COM LLC is a subsidiary of AT&T Inc. Formed in late 2004, the company operates a leading IYP and local search site, YELLOWPAGES.COM. The YELLOWPAGES.COM Nationwide Network provides exposure to up to more than 34 million monthly unique visitors (comScore Media Metrix, September 2007). Founded in 1999, Ingenio, Inc. the leader in live-search commerce, is helping the services economy flourish online by connecting millions of buyers and sellers around the world. Ingenio applications offer sellers the tools to acquire and monetize customers while providing consumers a means to interact with sellers rather than websites. Ingenio live-search commerce applications include: Pay Per Call(R), a pay-for-performance advertising service that enables the purchase of live customer phone calls generated through Ingenio Inc’s online and mobile search advertising network. Ingenio earn per call applications, Ether(R) and Live Advice, empower live experts to sell their services to individuals seeking real-time, personal and customized answers to their questions. For more information please visit http://www.ingenio.com/.